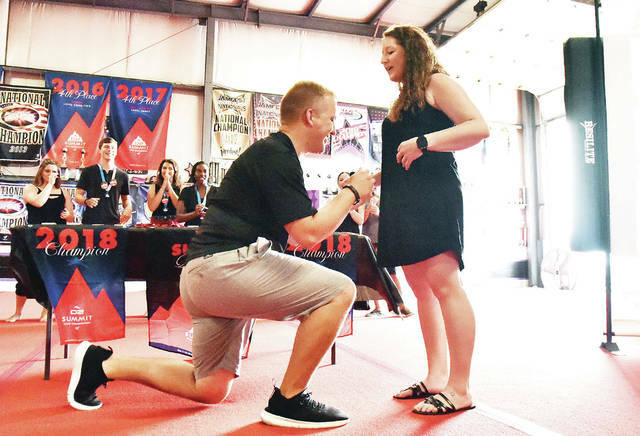 Dane Mansfield, left, proposes to his girlfriend Abbey Kramer, both of Shawnee, at the end of a ring presentation to the members of Kramer’s United Tumbling Academy national championship team Sunday, Aug. 26. SIDNEY — Members of United Tumbling Academy’s national championship All Stars Team Venom had just received their championship rings Sunday night when another ring ceremony unfolded before them. They watched as their coach and gym owner, Abbey Kramer, of Shawnee, received a marriage proposal from her boyfriend of 2 1/2 years, Dane Mansfield, of Shawnee. “I have three purposes at the gym,” said Mansfield after the other coaches had spoken and rings were distributed. “I unload the laundry detergent. I unload the flowers and I’m punching bag when she’s stressed. “I think you all know what Abbey puts into the gym — all the sacrifices for her family and your kids,” he said. “Some days she’s working 19 hour shifts. It’s been so cool for me to get to know everyone. “So since this is a ring ceremony, I’ve got one more ring I’d like to include,” he said as he dropped to one knee and asked Kramer to marry him. After receiving a “yes” response to his question, Mansfield said he couldn’t think of a better way to propose to Kramer. Kramer admitted she was shocked and surprised by the proposal. Mansfield said he purchased the engagement ring on Kramer’s birthday and kept it hidden until Sunday night. “I had it hidden behind my PlayStation,” he said.